Modeled on the "accelerators" that spot and develop tech-industry talent in California, Hatch describes itself as the first company dedicated to nurturing aquaculture startups. 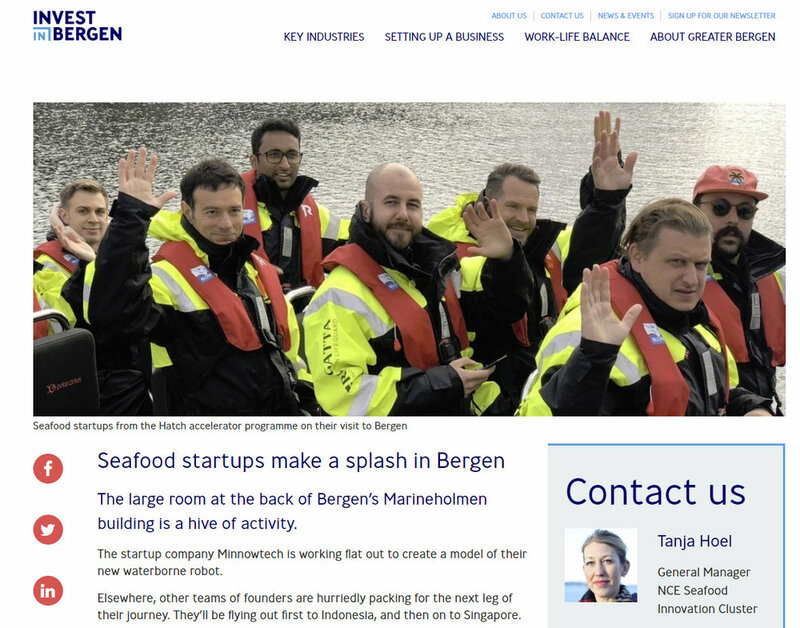 Co-founder Georg Baunach is backing companies using digital technology to build new online seafood marketplaces or combat the sea lice parasites that thrive in crowded salmon cages – the biggest problem facing Norway’s fish farms today. The large room at the back of Bergen’s Marineholmen building is a hive of activity. The startup company Minnowtech is working flat out to create a model of their new waterborne robot. Elsewhere, other teams of founders are hurriedly packing for the next leg of their journey. They’ll be flying out first to Indonesia, and then on to Singapore. BERGEN, Norway, Oct 30 (Reuters) - Norway has built the world’s biggest salmon-farming industry. But it wants to go bigger. With their lucrative oil fields now in decline, Norwegians have ambitious plans for aquaculture to power their economy far into the future. An international selection of aquaculture start-ups operating in disciplines such as agtech, analytics and AI arrived in Cork this week to begin Ireland’s first accelerator programme for aquaculture. 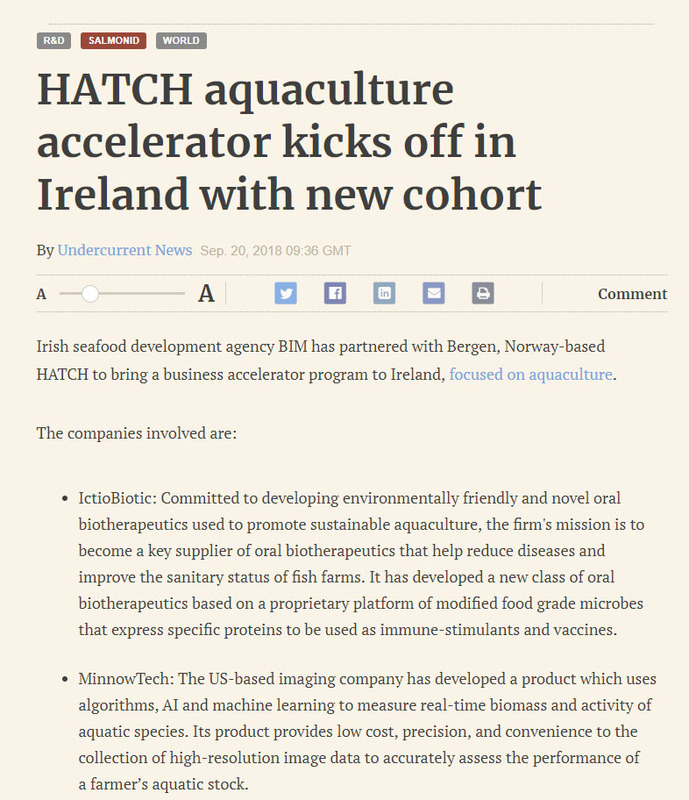 rish seafood development agency BIM has partnered with Bergen, Norway-based HATCH to bring a business accelerator program to Ireland, focused on aquaculture. Finless Foods, a San Francisco-based startup working on culturing tuna using cellular agriculture, has closed a $3.5 million seed round led by California tech VC Draper Associates. HATCH claims to be the world´s first startup accelerator focused on the aquaculture industry, and is currently seeking talented aquaculture startups from all over the world to participate in its three-month program beginning April 2018. Innovasjonsprogrammet er satt i gang i samarbeid mellom Hatch og Bergen Teknologioverføring (BTO), og er åpent for søknader fra hele verden. Hatch, the world´s first start-up accelerator focused on the aquaculture industry, is now offering funding and business support for talented aquaculture start-ups. Founder Carsten Krome has global ambitions for investment mentorship program. Carsten Krome, founder of Hatch, speaks at the Global Aquaculture Alliance's GOAL conference.